A combination of whipped blanket, feather, fly & chain stitch make up this design, inspired by a group of 1950’s stitchers who christened this style of stitching, ‘Dorset Feather Stitchery’. Our design by Cathy is worked on 100% cotton blue denim with colourful pure silk variegated threads. 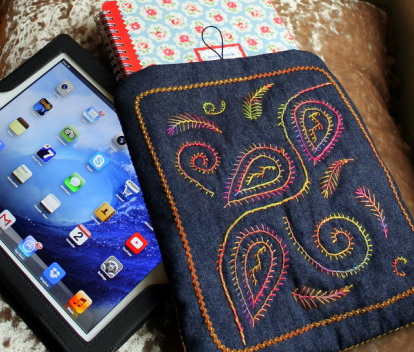 The design is made up into a quilted IPAD case, which takes a standard IPAD in its leather style holder, very useful for protecting it when travelling or carrying it around. You could also use the finished case for a special notebook or diary (also see photo below). Suitable for everyone, including complete beginners. After transferring the design onto a pre-prepared denim 'sandwich' with wadding and colourful lining, you will work the various stitches that make up ‘Dorset Feather Stitchery’. You can choose how far you wish to embellish your work and you could also embroider your name on the case (as in the photograph below). We aim for you to part-complete your stitching during the workshop. Full instructions will be given for you to complete your case at home. You will need a sewing machine to complete the case, but this is NOT required on the workshop itself.